« An embroidered alphabet: letter W and interesting things about flowers, road signs, etc. 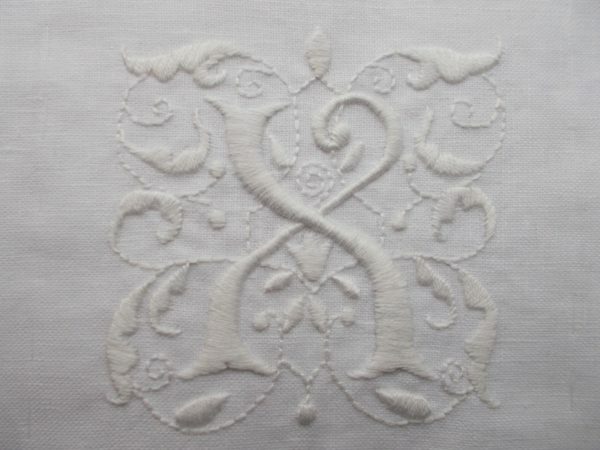 Having nearly gone through the alphabet embroidering one letter after the other, I’ve come to realise I especially enjoy this sort of white on white Renaissance style letter. 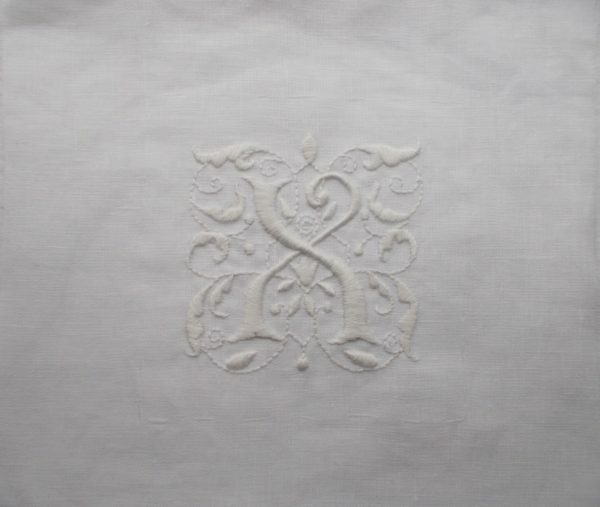 As hand quilting of the altar frontal will advance slowly I’ve decided I shall go back to the beginning of the alphabet and embroider all the letters again – but in whitework. Having two different pieces of work on the go can be enjoyable as when boredom with plain stitching strikes, a bit of embroidery can be a tonic. To the eye hospital this week to see if my husband’s squint and double vision can be corrected. Sadly, it seems the brain isn’t playing ball, so to speak, and refuses to use both eyes to achieve binocular vision. We don’t quite understand why Botox, which worked so well before he had his cataracts removed, will no longer be effective. The consultant, however, working on the principle that one more dose of Botox would do no harm, was willing to give it a try. Fingers crossed, but so far no improvement. Six degrees of separation suggests all of us can be linked to anyone via six or fewer social connections. In our case we have got our link to the tyrannical dictator of Syria, Bashar al-Assad, down to just the one! My husband’s eye consultant was at the Western Eye Hospital in London at the same time as Assad and, indeed, appears as a talking head on a recent BBC documentary (A Dangerous Dynasty: House of Assad). Assad was grateful for notes on a book the consultant was writing which helped him get through his exams and sent – of all the things he could – a tablecloth to say thank you! While you might have happily drunk a few bottles of wine and be done with it, how on earth do you ever use a tablecloth given to you by a brutal dictator? 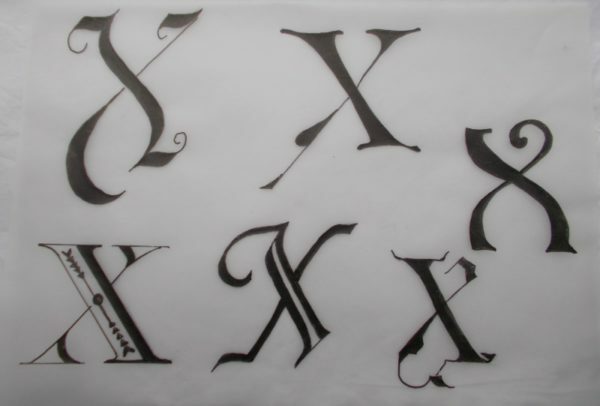 I like your X – and the other versions. There’s quite a lot of scope, especially when you start creating a Renaissance-style embellished variety, isn’t there! I’m not against tablecloths in themselves, Rachel, in fact I rather like them. But I think I would feel ambivalent about one with such uncomfortable provence! Yes, I think I shall enjoy embroidering a few curlicues here and there. I particularly like this X. Do you pad the satin stitch? It’s a good idea to have something as a break from quilting which is, of course, the same stitch over and over and yet over again. I also have a tapestry on the go which is also totally repetitive. Perhaps a little embroidery would be a good idea. I’m considering a sampler using some of your initials. Hope your husband’s eye improves. Anne, I just padded the X and the plumper leaves with a bit of chain stitch or stem stitch. A bit of embroidery on needlepoint would not only relieve the boredom of tent stitch but would also give a bit of texture and more interest to the canvas. 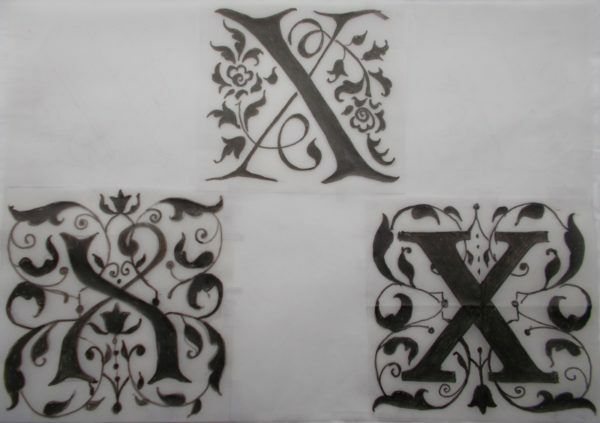 Initials, a single word or even a phrase might be fun and would make it more personal.